The 5-story Bio Intelligent Quotient (B.I.Q.) 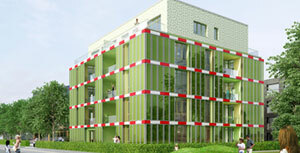 building, constructed to Passive House standards , gets all its energy from renewables. The addition of algae on the outside walls will be used to create biofuels to heat the building and also to provide shade and muffle street noise. The technology is "an outstanding and important development in the use of renewable resources in building technology," comparable to advances in the space program, Lukas Verlage, managing director of the Colt Group, part of the consortium that designed it, told the NY Times . Another "living" building is in Mexico , where the façade neutralizes surrounding air pollution.